Well, I think I’ve finally seen it all – as far as baking goes. Months ago, I was browsing through Williams Sonoma’s Easter catalog and came across a 6-bunny “cakelet” bundt pan. I laughed out loud when I saw it and was still chuckling to myself when I clicked the “buy” button. 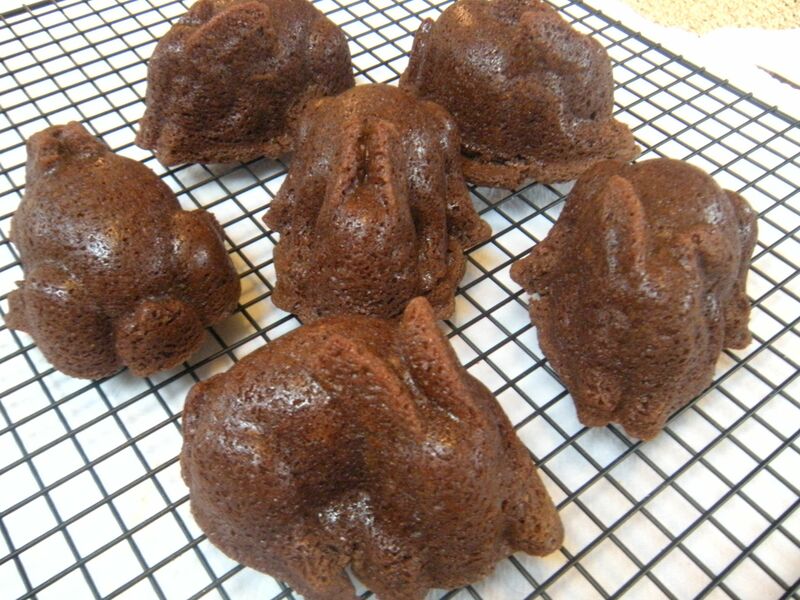 When it arrived, sure enough, there were six little bunny molds in various poses formed in one solid bundt cake pan by Nordic Ware. 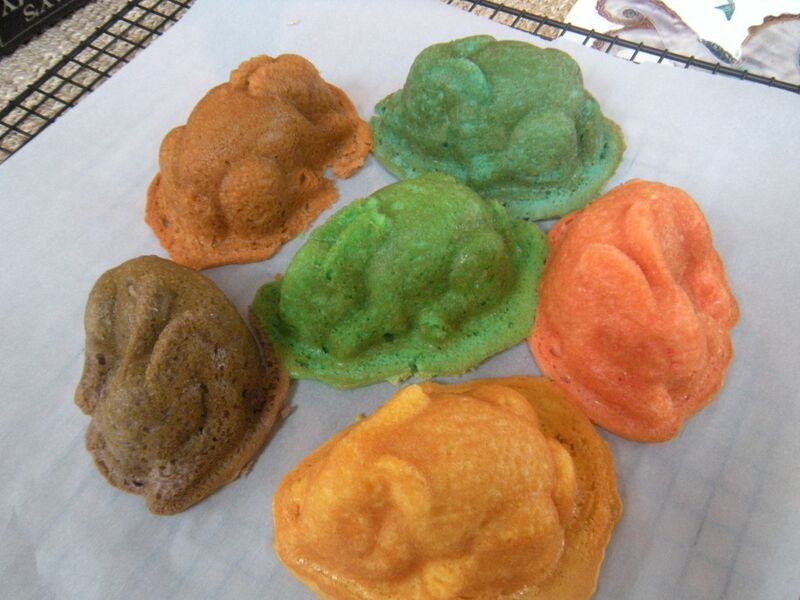 The other day, I thought I’d do a trial run and make a box of yellow cake mix and experiment with food coloring to make different colored bunny cakes. They turned out all right but the biggest lesson learned was that I had filled up the batter too high which resulted in towering humps of cake that I trimmed off and around before harvesting the bunny cakes. They went out to neighboring family, all of whom enjoyed these little cakes. Fortified with experience, I looked online for a chocolate cake recipe that had body and richness. After all, if these were meant to be enjoyed for Easter, why use a box cake mix? I came upon a chocolate sour cream bundt cake recipe that promised to be very rich and full of flavor. It also didn’t require using a mixer either which is a godsend because the portable mixer I have is extraordinarily awkward to use, even though it’s manufactured by Kitchenaid, the emperor of mixer manufacturers. This recipe just calls for melting butter (kerrygold unsalted); unsweetened cocoa (Ghirardelli), water and salt. Let cool. Mix together dry ingredients: flour, organic sugar and baking soda. Add wet to dry ingredients and whisk together. Whisk in two extra-large eggs, one at a time. Whisk in a container of sour cream. Then add a teaspoon of vanilla. That’s it. I filled up each opening three-fourths of the way to the top. Baked for 25 minutes until toothpick came out clean. They had still puffed up above the top of the pan but I thought they would settle down by the time they cooled. Fifteen minutes later, I put them upside down on a rack, whacked each one sharply with a stainless strainer spoon and holding my breath, I lifted the pan. They came out perfectly – shiny brown and as cute as could be! My plan was to let them cool completely at room temperature and then to place them in heavy-duty freezer bags, two coved together in a bag. Then freeze them until they’re hard. Wrap them in bubble wrap and priority mail them to family in MPLS along with Easter basket for granddaughter, Josie. Ditto for my son-in-law to take down to his family on Easter. When they are defrosted, whip up some fresh cream and serve with a bowl of raspberries. Yum! Ain’t that the berries? Er, ah, bunnies, I mean? Before mailing the cakelets this morning, I made the bitter chocolate glaze that’s included in the recipe above. Heated up heavy cream, sugar until almost boiling; chopped up a bar of Lindt’s bittersweet chocolate, added light corn syrup and stirred the hot cream mixture into the chocolate to mix altogether. I confess I’m not that much of a chocolate aficionado but this glaze was out of this world! – very chocolatey but not too sweet. I packed a portion of it with each of the cakelet shipments to be warmed and drizzled over the cakes before serving. Hope it all travels well! What a novel idea! I think you may have started a family Easter tradition (like my Jello eggs)! Hi Beth, I think you’re right! Do you have a photo of your Jello eggs? I do! When I find it I will send to you!